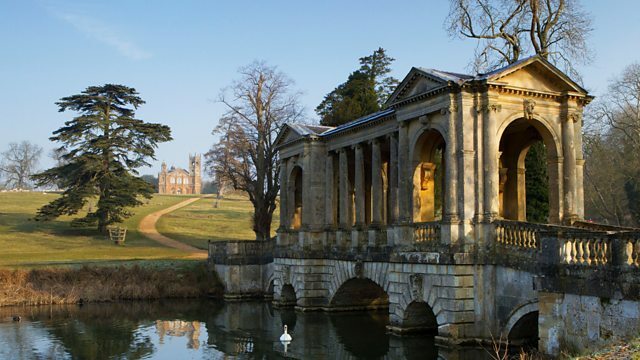 Series exploring four iconic gardens looks at Stowe, which launched the career of Capability Brown and fostered a rebellion that overthrew the first British prime minister. Stowe, one of the most remarkable creations of Georgian England, is the birthplace of the landscape garden. Created on a vast scale with 36 temples, eight lakes and a dozen avenues, Stowe launched the career of Lancelot 'Capability' Brown and fostered a rebellion that overthrew the first British prime minister, Robert Walpole. Rather than being a garden of flowers and shrubs, Stowe is a garden of ideas and its grottos and classical monuments spell out a furious, coded political manifesto. Stowe's creator, Viscount Cobham, dreamt of climbing to the pinnacle of political power and establishing a long-lived dynasty, but less than a century after his death, his family was to become the most scandalous bankrupts in English history.